"The information spread by one of the Israeli news outlets about an alleged ‘interception' of two Israeli F-16s by a Russian Su-34 in Lebanese airspace is amateur nonsense," the Russian Defense Ministry stated. The ministry specified that "the Su-34 multirole bombers, which belong to the Russian air group in Syria, are not used for flights to intercept aerial targets and do not perform tasks in the airspace of Lebanon." 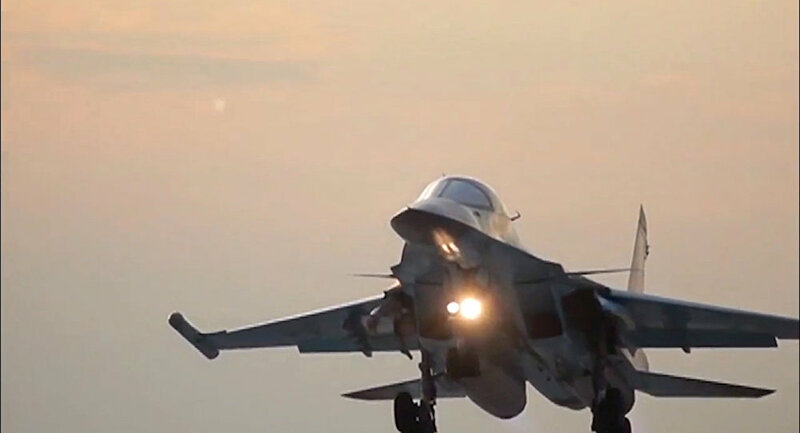 The comment follows reports earlier in the day in Israeli, Lebanese and Russian media outlets, claiming that the two Israeli Air Force jets had been challenged by a Sukhoi Su-34 bomber over Tripoli and forced away. The presence of the Israeli aircraft in Lebanese airspace was reportedly connected with reconnaissance missions. At the same time, the media explained the actions of the Russian bomber as being a part of drills, reportedly taking place off the coast of Lebanon and Syria. The media claimed that the Russian bomber was forced to land due to bad weather conditions. Russia and Israel established a mechanism to prevent conflicts and potentially disastrous mistakes in 2015 after Russia started its military operation in Syria at the request of Syrian President Bashar al-Assad. The mechanism includes work groups led by deputy chiefs of both militaries. However, as Israeli Air Force Commander Amikam Norkin revealed last week, the existing system is limited: Israel doesn't inform the Russian side about its planned airstrikes in Syria, the same goes for the Russians. The greater part of Russia's forces were withdrawn from Syria last year by order of Russian President Vladimir Putin, which followed the declared defeat of the Daesh* terrorist group in the country. Since then, the Russian military presence in the country has been limited to military advisers, units of special forces of the Russian Defense Ministry, military police, as well as servicemen of the center for reconciliation. Israel has intensified its airstrikes against what it claims to be Iranian military units in Syria in recent weeks. Reacting to claims of an Iranian military presence in Syria, Tehran has denied any extensive military presence on the ground, specifying that its contingent is limited to military advisers in the country and is there to assist in the fight against terrorism. Similar to the Russian military offensive on the ground, the Iranian mission has the approval of Syria's internationally-recognized government.